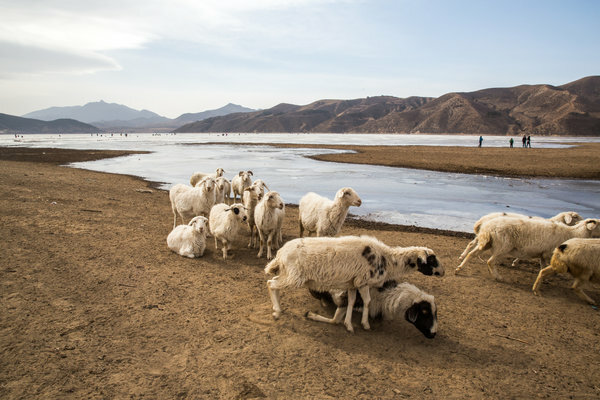 JIUZHANBAO, China — A few times a year, rains sprinkle the dry mountains north of Beijing, feeding streams that trickle down to catchments like the Yunzhou Reservoir. From its shores, the water shimmers and sparkles, a mirage that local farmers can see but not touch. Instead, the water is earmarked for the greater Beijing area to the south, and in the winter, increasingly, for making snow. China, which has been constructing a tourism belt around Beijing centered on water-intensive sports like skiing, is now building ski slopes in a bid to host the 2022 Winter Olympics. The International Olympic Committee inspected the region’s facilities last week, and it is expected to make a final decision in July. If Beijing wins, it will be the first city to host the Winter and the Summer Games, which it held in 2008. Its only competitor is Almaty, Kazakhstan. A ski resort near Zhangjiakou, China, that will be used as a venue for some events if China holds the 2022 Winter Olympics. Artificial snow makes up for a shortfall of the real thing. Sim Chi Yin for The New York Times. According to Beijing’s bid, the environmental impact of the Games would be “ecofriendly” and “sustainable.” In their three-volume filing with the I.O.C., organizers say they will use renewable energy and sustainable building materials. Forest cover lost to ski slopes or other facilities would be offset by new tree plantings elsewhere, in compliance with I.O.C. requirements. “Abundant” is not a word often used to describe Beijing’s water supply. Although some parts of the city receive up to 23 inches of rain a year, the mountainous area where the ski resorts are being built and the Games would be held receives 15 to 16 inches, making it semiarid. Two-thirds of that precipitation falls in the summer. In December and January, areas like Chongli, where the reservoir is, receive about a tenth of an inch of precipitation, meaning they are usually bare throughout the winter. Beijing used to be rich in water resources, but it dried up as its population doubled over the past 25 years to an estimated 22 million. A $62 billion project to divert water to the north from the water-rich south has begun, but it is expected only to stabilize the situation. Beijing has proposed the Chongli area for events like snowboarding, freestyle skiing and cross-country skiing. Chongli already has several ski slopes, but at least one other Olympic ski run and a sledding run are under construction. One of the larger ski resorts that had closed has reopened, and another is set to expand if Beijing wins the Games. 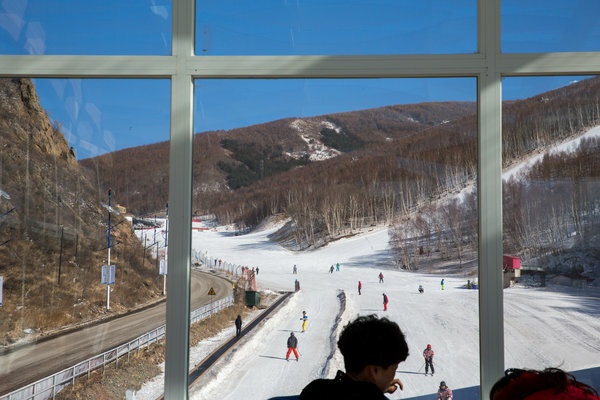 Yanqing Songshan National Forest Park, which has the only substantial mountain near Beijing, was chosen for Alpine skiing, which requires longer runs and steeper descents. Yanqing has no existing ski slopes. Beijing and Chongli officials did not respond to repeated requests for interviews. Experts who follow the ski industry say that its expansion into water-stressed environments like Beijing is increasingly the norm. Relatively dry or warm countries like Turkey, India and Pakistan all have new resorts. The site of the last Winter Olympics, the Russian resort town of Sochi, gets only 21 inches of precipitation a year, which forced organizers to stockpile nearly 600,000 cubic yards of snow to ensure adequate cover. 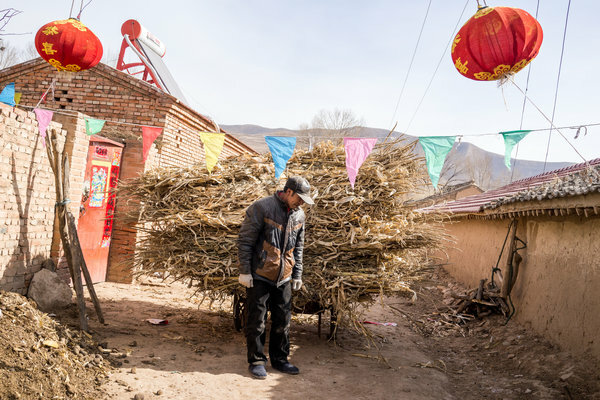 Fan Dengjun, a farmer in Jiuzhan, said he could double his harvest if he had more water, which China has been using to make artificial snow. Sim Chi Yin for The New York Times. Carmen de Jong, a professor at the University Savoie Mont Blanc in France who studies water and Alpine sports, said such developments were ecologically unsustainable. The alternative to Beijing for 2022, Almaty, is not much better. It receives just 22 inches of precipitation a year, and it relies on dams and water towers to feed its snow-making machines. Resorts in the Alps, by contrast, regularly receive more than 40 inches of precipitation a year. Some of the most famous areas get nearly 60 inches. But even these regions are now relying on artificial snow because of climate change. Another concern for conservationists is that both Beijing and Almaty plan to build Olympic ski resorts in their national parks. Beijing’s organizers are planning to use Xiaohaituo Mountain in Yanqing National Park for the Alpine events. The mountain is part of a protected nature reserve, and automobile traffic is banned. Officials have said construction will begin there only if Beijing wins the bid. Studies show that ski runs increase erosion and destroy plant life beyond simply the growth that is cut down; they can also cause permanent damage to topsoil and plants beneath the surface. Artificial snow worsens this problem because it often creates an ice sheet over the ground, leading to the growth of mold underneath. During a visit in February, the Haituoshan mountain range had no snow at all. Locals said that water for artificial snow would come from the nearby Guanting Reservoir. Zeng Lian, a local farmer, said he hoped Beijing would win the bid. “The leaders have been here several times, and if Beijing wins, we can develop,” he said. A ski resort would provide revenue for his village, Haituo, long after the Games ended, he said. Most residents live off corn farming, herding and selling supplies to hikers. Yunzhou Reservoir is a catchment area for water that flows from mountain areas to the north of Beijing. Local farmers are not allowed to use the water. Sim Chi Yin for The New York Times. The planned investment is huge. For the Xiaohaituo area, the government would invest $163 million, including for a 35-acre Olympic Village and 940 hotel rooms.In nearby Chongli, the investment is less — $95 million — because some facilities already exist, such as the Genting Grand Secret Garden, a Malaysian-owned resort that would host some of the Nordic events. On the nearby slopes, skiers seemed excited about the prospect of hosting the Games. All of the snow parks in Chongli use artificial snow. During a visit in February, the ground next to the ski runs was dry and the nearby hills were brown, except for an occasional dusting of snow in shaded areas. Artificial or not, the new industries have brought relatively good-paying jobs to the area. Service personnel can earn about $500 a month, compared with the subsistence-level farming that existed before. Until the resorts began opening over the past decade, Chongli was officially designated an impoverished county. The viability of this economy is open to debate. One of Chongli’s ski resorts, Duolemeidi, closed two years ago. Resort officials rejected requests for interviews, but locals said rising water prices had made snow-making too expensive. The resort reopened recently in the hopes that Beijing wins the Games. For those without jobs in the ski tourism industry, the prospects are daunting. Mr. Cheng, the farmer near the Yunzhou Reservoir, said agriculture was increasingly difficult because climate change had reduced rainfall. Pumping water out of the ground is also becoming harder, he said. Studies show that Beijing’s water table has been sinking up to two feet a year. And yet, like almost everyone interviewed in this area, he thought it would be great if Beijing won the bid. Sarah Li and Patrick Zuo contributed research from Beijing. Where is the capital’s skiing industry going?